Village House is 1km from Phong Nha main town and boat station to go to Phong Nha cave. You can ride with free bicycle at our homestay on village roads to boat station go to Phong Nha cave and explore Phong Nha national park. 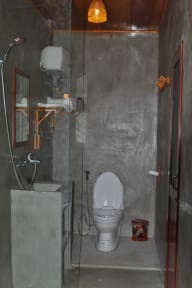 Our homestay have both private room and dorm room with private bathroom, air-conditioning, hot shower, free wifi and mini bar. also, front of Village House is SON river where you can swim in nature and relax at a wood-house with hammocks, chairs and table. 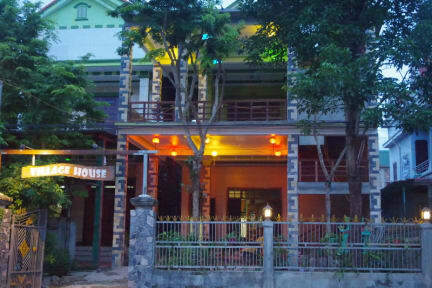 specially, staying here, you will be met local people, learn local culture and join dinners with family. There's local food only and you can study cooking if you want. 1. Running by a local family , we have 24/ 24 reception. 2. Check in time: 2pm. 3. Check out time: 11am. 4. We can help you to check in or check out more early or late if you ask. 5. Free Cancellation with 2 days advance notice before arrival. Otherwise, the fist night room fee will be charged as penalty. 6. Payment Method upon check in by Cash Only.